There are two traditional tipis at this glamping site with very similar design. Each sleeps up to four comfortably, with two double beds, an electric light, and some basic shelving. 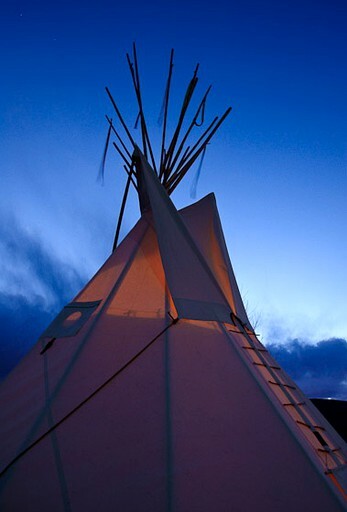 Both tipis have an electric outlet for your use. Restrooms with showers are conveniently located nearby. 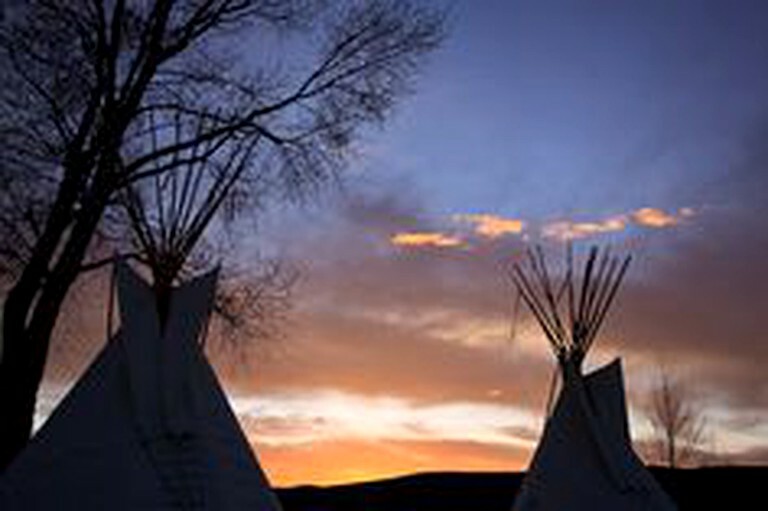 The tipis will keep you and your family sheltered from the elements but in early spring and autumn it can get a bit chilly, so pack accordingly. Electric heating is available upon request. No smoking permitted in the tipis. This campsite offers glampers, clean, grassy well landscaped areas to set up camp for a few nights. Conveniently located between Blue Mesa Lake and Gunnison, this site has everything you'll need to have a perfect vacation! Enjoy beautifully shaded or open sites with full hook ups depending on your preference. There is 30 and 50 amp service, luxury hot tub sites and a number of pull through spots. There are communal fire pits and a small playground area for guests to enjoy. The club house is utilized by guests for playing cards, dominoes, and other games. The Rec hall can be used for larger functions such as socials and potlucks. This area is filled with incredible outdoor adventures for families to explore. There is great shopping and restaurants by Crested Butte and be sure to check out the Mountain Heritage Museum there as well. The Black Canyon of Gunnison has spectacular steep walls that change color in the light. You can go golfing, head for a ride down the river, or hitch a ride on an ATV in the Taylor Reservoir. Aside from the incredible outdoor activities guests will also find farmers markets, hot air balloon tours, observatories, and art venues. This site has a little something for everyone, no matter what kind of vacation you want! Nightly temperatures early in the season and late in the season, from April 15 through October 15, can get a little chilly. Please plan accordingly. Children and pets are welcome! Dogs must be leashed at all times and may only be walked in the designated dog walk area. Only two pets are allowed per site, and there is a $45 pet cleaning fee. There is a pet service if guests can't take their furry friends along on all outings. For a small fee of $10 per pet, the hosts will walk and feed them while guests are out exploring. Guest parking is available for $5 per day, all overnight guests will be charged this fee.